Why are Mosquitoes so Hard to Control? If you live where mosquitoes are a problem and you have to deal with them outdoors a lot, you might wonder why we can send men to the moon and build a computer that can beat us at chess, while the problem of eliminating these tiny pests eludes us. The fact is that mosquitoes, similar to other predatory insects, have a sophisticated set of survival skills that have been honed through 170 million years of evolution, and we humans aren't even the worst they've seen. The fossil record has it that they started out in their present form in the Jurassic period, right back there with the dinosaurs. Consider that whatever killed the dinosaurs failed to wipe out the mosquitoes, and you start to get an idea just how hardy they are. Mosquitoes have better senses than most insects. They are unique in the insect world for having excellent eyesight, enabling them to single out a moving mammal target from hundreds of feet away. They are also hyper-sensitive to the carbon dioxide exhaled by all mammals, and can also pick up the scent of a drop of sweat from half a mile away. This is one reason why decoys and lures such as bug zappers aren't effective against mosquitoes, who mostly know better than to go near them. Mosquitoes aren't picky in diet. Any warm-blooded creature is a meal to a mosquito. This is why they are such massively promiscuous transmitters of diseases, since any disease which can hop from one species to another has few means of doing so except through a winged blood-sucking creature that bites everything it sees. The larval stage of mosquitoes is equally omnivorous, and will generally eat anything smaller than they are until they reach the pupa stage. The blood-sucking isn't a necessary part of all of their diet, either, as the males only feed on fruit nectar and the females only bite when they need enough protein to lay eggs. The mosquito has relatively few natural predators. This is because the mosquito has mastered the art of being inconvenient; anything that's big enough to eat it is too big to derive sufficient nourishment from it to be worth the trouble. Bats, long rumored to be an effective control, actually derive 99% of their diet from other sources. Dragonflies alone are the chief predators of mosquitoes, and they are difficult to cultivate since they themselves have delicate environmental requirements. Many species of birds eat mosquitoes along with other bugs, but with the exception of the purple martin no known method exists to encourage more of these species to live in a particular area. These hardy insects aren't going away without a fight, but we have some top scientists working on their eradication. 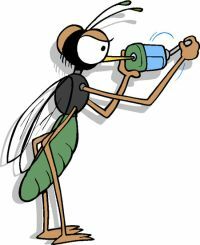 Lately efforts have been advanced to create a mosquito trap, which actually mimics a warm-blooded creature by giving off carbon dioxide and a sweat scent as well as heat. While these devices are still in research and development, they represent some of our highest hopes of getting rid of the mosquito plague once and for all. Why Some People are Resistant to Mosquitoes? Copyright © 2007 SkeeterBite, All rights reserved.